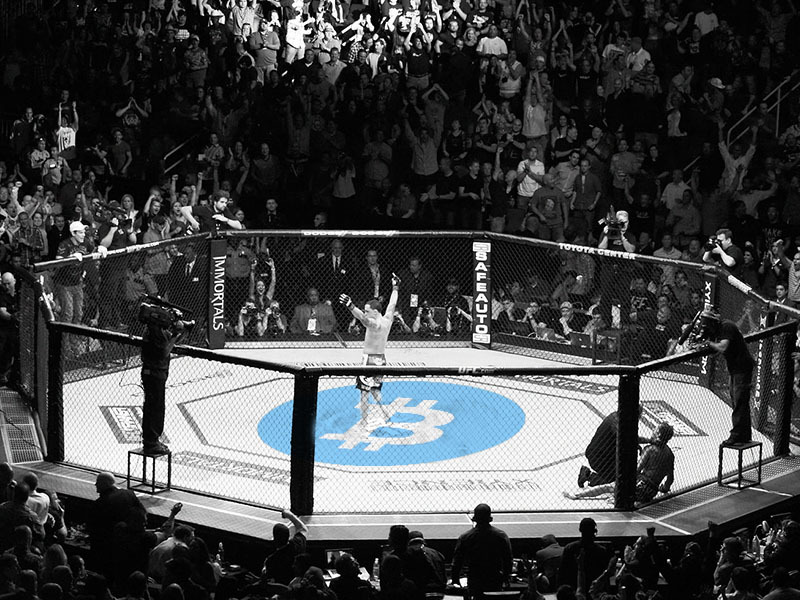 Bitcoin is becoming the preferred payment method for sportsbooks. It is cheaper than other deposit and withdrawal options for both sportsbook and player, compared to other methods that often involve high fees and sometimes long waiting times. It is clear that not only bitcoin “freaks” are using bitcoin to bet on sports, but that bitcoin knowledge is a skill of a growing number of sports bettors nowadays. Let´s take a look at some of this weekend´s UFC matchups. The main event is a fight for the welterweight title. Lawler, coming off a title defense against Carlos Condit, has won his last five fights. Woodly has not fought since January 31st, 2015. He was set to face Johny Hendricks, but Hendricks pulled out due to medical reasons. Both Lawler and Woodley have a strong wrestling base. It is going to be hard for either of them to get each other down. However, we might see Woodley test Lawler´s takedown defense. Both fighters have one punch knockout power, and they are also both hard to put away. Although Woodley has shown some cardio issues in the past and does carry a lot of muscle mass that can produce fatigue, I think this fight will go over 2.5 rounds. In the co-main event, we have a three-round battle in the strawweight division. Both fighters are coming off win streaks, with Rose winning the last three and Karolina her last two fights in the UFC. Rose uses a variety of striking including spinning attacks and kicks. She also has high-level BJJ and a list of submission wins. Karolina has a clean technical striking style, mixing up punches and kicks well in combinations. Karolina was in trouble on the ground in her fight against Ronda Marcos but defended submissions well. That being said, I think Rose has a clear advantage in the submission department. If Karlolina can avoid clinch and the ground she has a good chance of winning this fight. The odds have her as a 3.00 underdog, which I think is not giving her enough credit. I think the fight will much closer and should be a pick em. I will take the dog this time. Both fighters are coming off losses, and are going to want to make a statement. These two fighters have similar styles with good wrestling and a willingness to make the fight ugly. They can fight against the cage and in brawling exchanges. This fight will most likely take place standing, and the wrestling from both fighters will cancel each other out. Both fighters have knockout power, and I see this fight going over one and a half rounds. These guys will show enough respect the first round, feeling each other out, and possibly testing each other´s takedown defense while being pressed up against the cage. This card is stacked, and features the return of Ian McCall against up and coming prospect Justin Scoggings. The dark horse for fight of the night pick in the prelims is Ross Pearson vs. Jorge Masvidal. Odds for the prelims are not out yet, but will be as the week moves on. Follow or Fade? Do you agree with these picks or are you going the other direction? Let me know what you think in the comments below. Cover image courtesy of James Law.